Bolt On a 351C Intake! 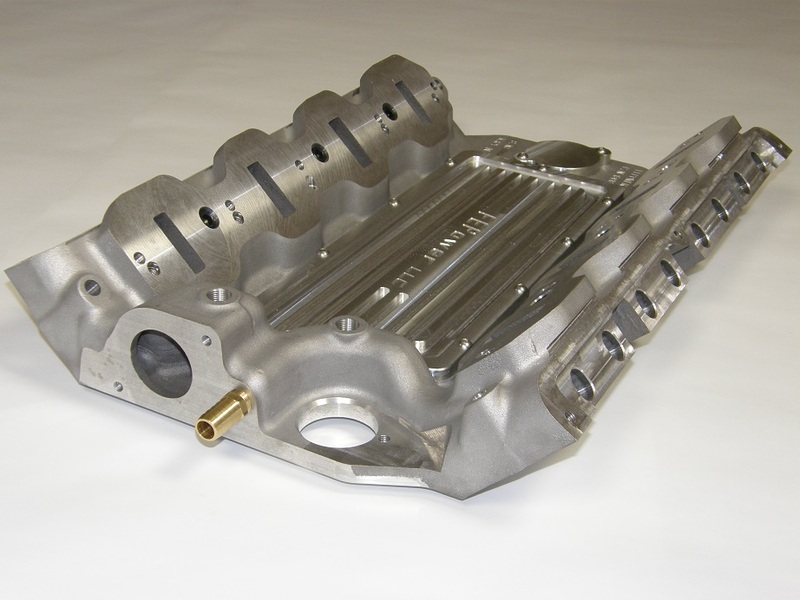 FE Power LLC manufactures cast aluminum intake manifold adapters, to fit a Ford 351C 4V intake manifold on the FE engine. Several versions are available, for standard 351C and Yates style intakes, plus unported versions for custom applications. Descriptions of the intake adapters are given below. Terms: Shipping via UPS to lower 48 state destinations is $45. Shipping to Alaska, Hawaii, Puerto Rico, or international destinations is via US Postal Service and is calculated individually for each shipment; please contact us for shipping costs to these locations. Minnesota residents add 7.275% sales tax per part. Personal checks allowed 5 business days to clear before parts will be shipped. All sales final. The FE Power #13001 cast aluminum intake manifold adapter is designed to fit all FE series engines (332-352-360-390-406-410-427-428) with standard low-riser or medium-riser cylinder heads. This adapter allows any 351C 4V intake that will fit the factory 351C 4V heads to be installed on the FE engine. 351C 2V intakes can also be installed, but port matching will be required. Two of the photos show an Edelbrock Torker II and a Weiand tunnel ram positioned on the adapter. Please note that this advertisement is for the ADAPTER ONLY, and does not include the 351C intake manifold. - The adapter allows use of a variety of 351C intakes, including single and dual planes, tunnel rams, Weber and injector manifolds. 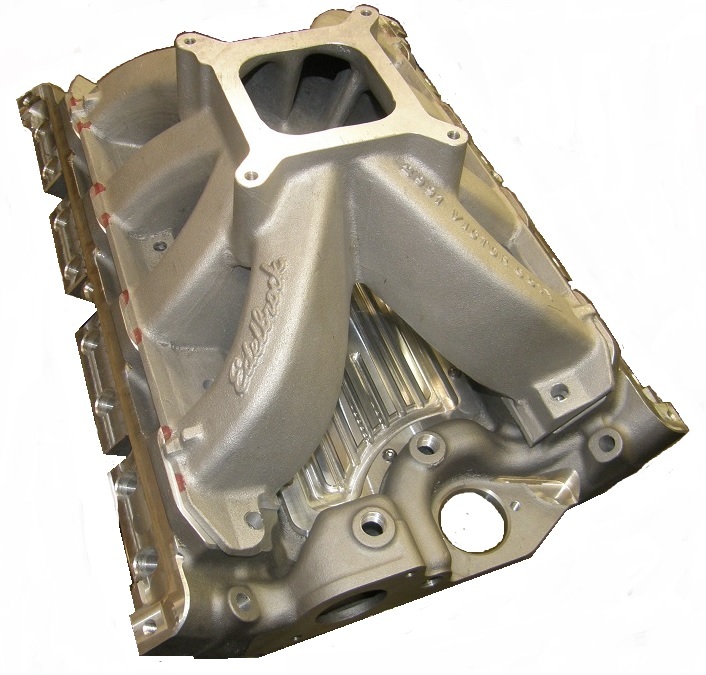 - Ports in the intake adapter are CNC machined, and are designed to fit medium riser or low riser FE cylinder heads, and aftermarket 351C 4V intake manifolds such as the Edelbrock Torker II and the Weiand tunnel ram. The ports are slightly undersize to allow port matching to the application. - With the adapter in place the intake manifold can be changed without having to remove the valve covers, pushrods, rocker arms, and distributor, and the water jacket seal between the cylinder head and the intake adapter remains intact. - The valley of the engine is accessible through an access panel, after removal of the 351C intake. Flat tappet lifters and most roller lifters can be removed and replaced through this opening. The access panel and the machined road draft tube cover at the back of the intake adapter seal to the adapter with O-rings; no gaskets are required. - The intake adapter comes complete with six allen head capscrews required for installation, and is completely Made in USA, by FE Power LLC. 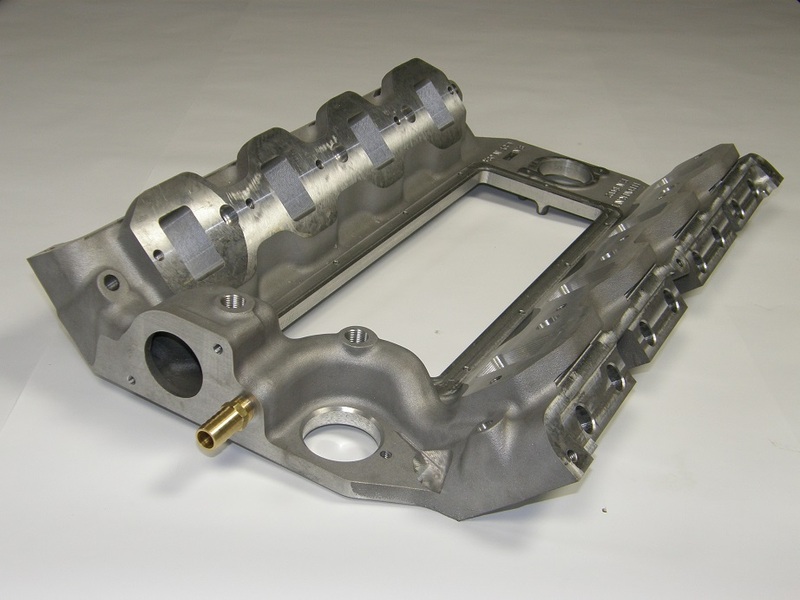 -In order to clear the water jacket on the intake adapter, a stock-type 351C 4V intake manifold must be modified to remove a portion of the front rail. 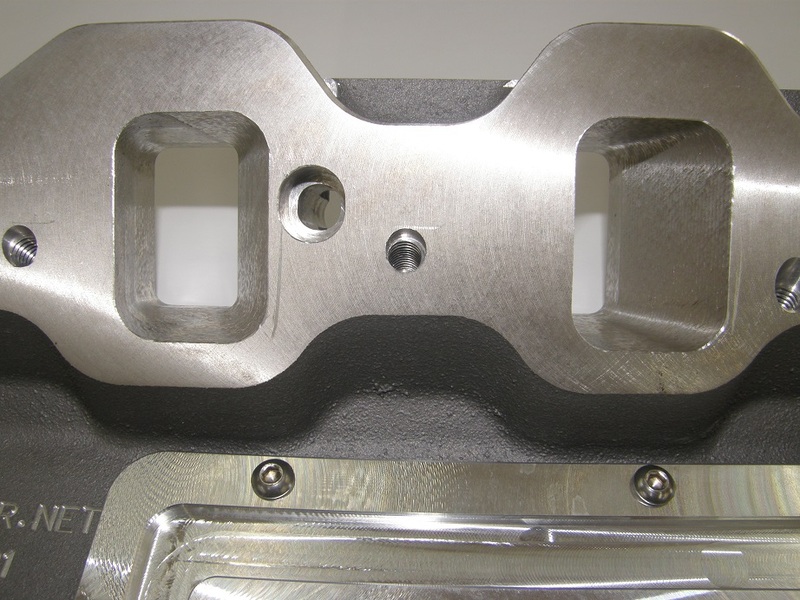 This can be done using any number of methods involving cutting, grinding, or machining. A template for the required modification is included with the intake adapter. After this modification, the 351C intake manifold is no longer suitable for use on 351C engines. If you would prefer to have this modification performed for you, FE Power offers this service on most of the 351C intakes for $85.00; please contact us for details. - This intake adapter will fit aftermarket heads such as Edelbrocks, Survival Motorsports, and BBM. However, please note that if extensive porting has been done on the heads, and the roof of the port has been raised by more than 0.250", there may not be sufficient material above the port on the adapter to permit a good sealing surface. FE Power LLC offers a different version of this adapter for heads with significantly raised ports; please contact us for details. - This intake adapter will fit the early version Blue Thunder medium-riser cylinder heads, but not the later version with the large ports. 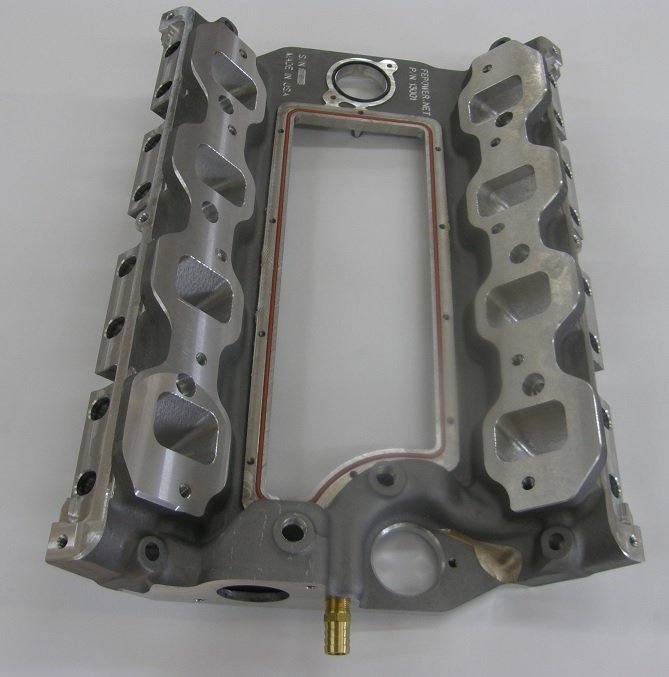 FE Power LLC offers part number 13103 for those cylinder heads; contact us for details. - This intake adapter will not fit high riser or tunnel port heads. FE Power LLC offers part number 13101 for high riser applications, and part number 13180 for tunnel port applications. - This sale is for shipment to lower 48 US destinations only. If you are in Alaska, Hawaii, Puerto Rico, or outside the US, please contact us for international shipping information. 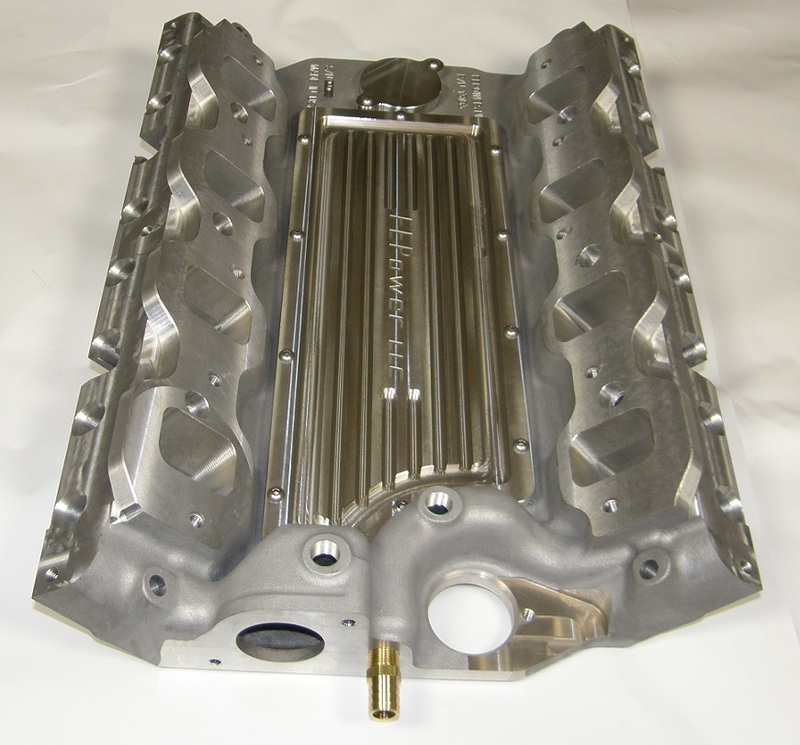 - In many cases, custom versions of the FE intake adapters may be best for a given application. For example, with extremely wide ports or offset rocker arms, it may be advantageous to move the pushrod holes in the adapter away from the ports. For many of these special requirements, FE Power can accomodate these changes at no additional cost, and deliver a custom intake adapter for the application. Please contact us to discuss your specific requirements. The FE Power #13002 cast aluminum intake manifold adapter is designed to fit all FE series engines (332-352-360-390-406-410-427-428) with standard low-riser or medium-riser cylinder heads. This adapter is designed as the starting point for a sheet metal intake. The ports come straight out of the adapter, rather than bending in to match up to a 351C intake. Note that a 351C intake will not fit on this intake adapter. In addition to the intake adapter, FE Power also offers a plate that bolts onto the #13002, and can be used as the starting point for a sheet metal intake. These plates are part number 13204, cost $125 per pair, and feature O-rings that seal to the intake adapter, so that no gasket is required between the intake adapter and the sheet metal intake. Pictures of a #13002 intake adapter, one showing the ports plates, are down the page at right. 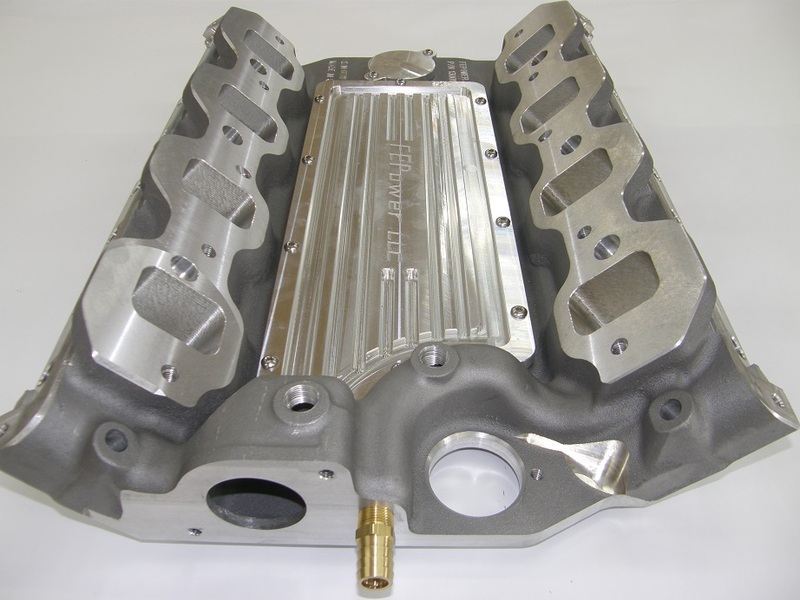 The FE Power #13003 and #13004 intake adapters are designed to fit all FE series engines (332-352-360-390-406-410-427-428) with standard low-riser or medium-riser cylinder heads. These adapters is designed for use in custom porting applications. The #13003 intake adapter has small starter ports that can be enlarged to fit a particular intake manifold, while the #13004 intake adapter has no ports cut at all, for a completely custom porting application. Pictures of the #13003 and #13004 intake adapters are down the page at right. The FE Power #13006 intake adapter is designed to fit a Yates style 351C intake onto the FE engine. There are several excellent Yates-style 351C intakes available; FE Power has had good luck with the Edelbrock 2863 intake. Please note, however, that there is special machine work required on the Yates intakes to make them work with the intake adapter; for example, the flanges must be thinned down by up to 1/2" in order to fit on the intake adapter. 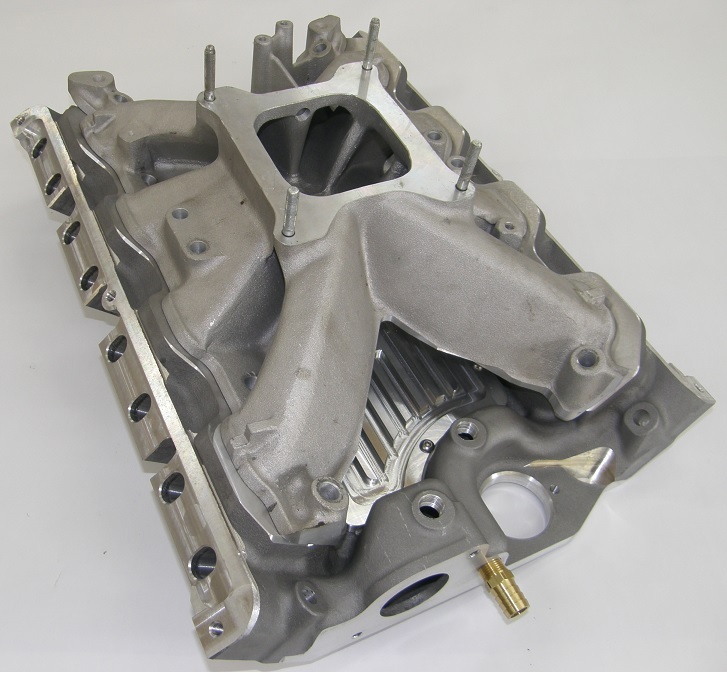 FE Power recommends sending your intake to us for machining to fit on the intake adapter; we provide that service for $85.00. 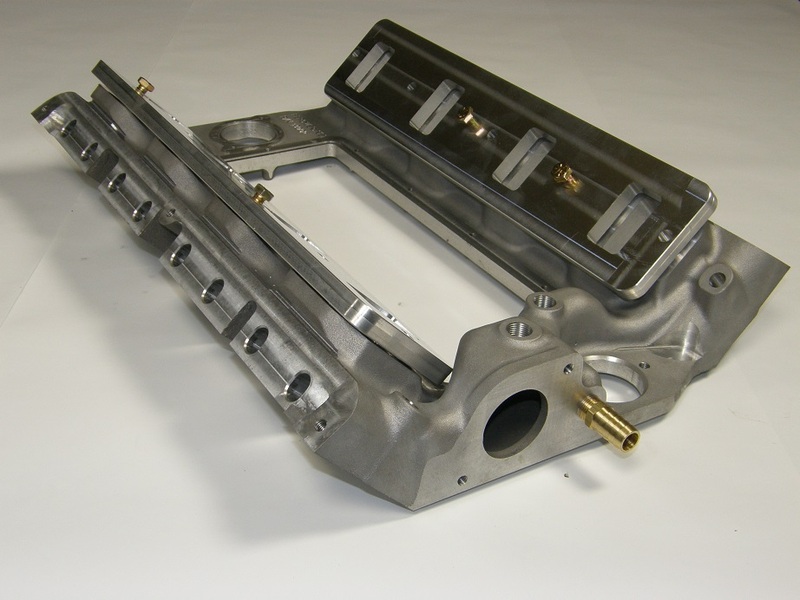 Also, porting of the intake adapter/intake manifold interface is highly recommended when using these intakes, to generate the best flow potential. 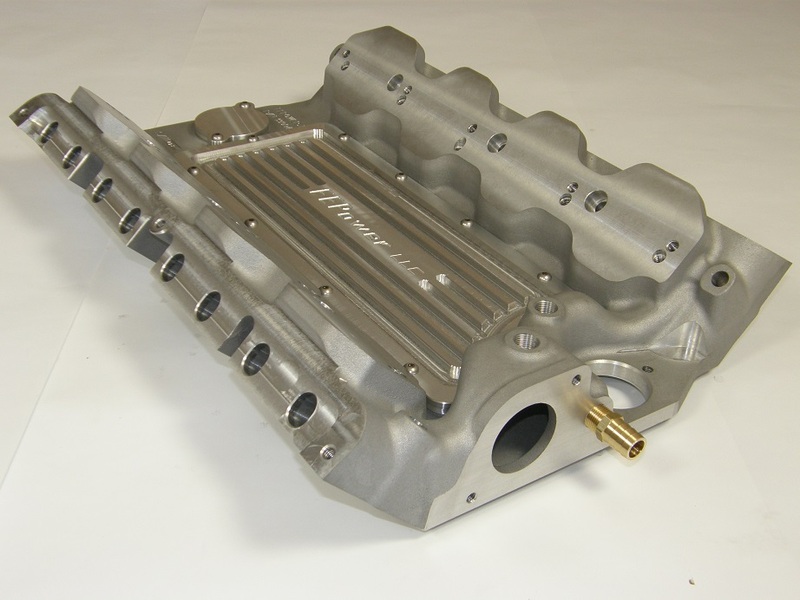 A picture of the #13006 intake adapter fitted with an Edelbrock 2991 intake manifold is shown down the page at right. 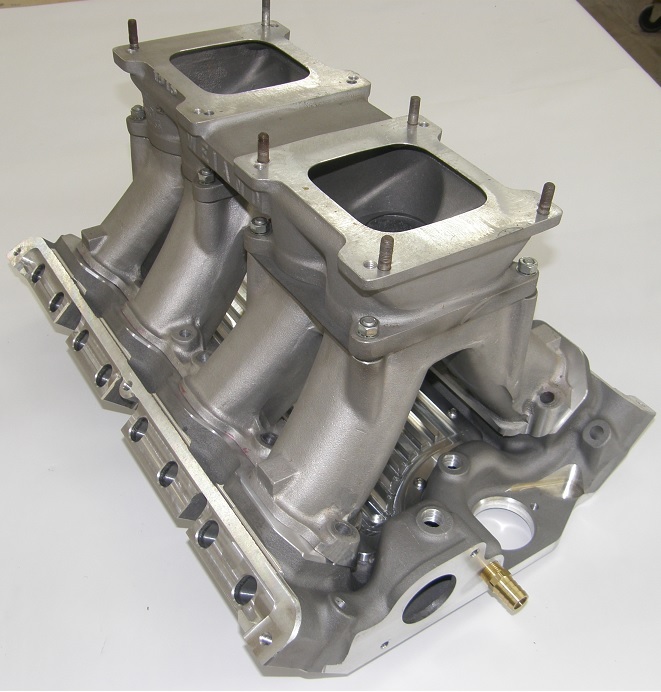 The FE Power #13103 intake adapter is designed to fit the later Blue Thunder medium riser heads. These heads have very large intake ports, with the roof of the port raised for better flow. The standard 13001 intake adapter will not work on these heads, because there is insufficient room above the port on the intake adapter for sealing to the heads. The #13103 intake adapter starts with a high riser casting, in order to leave enough material above the port for proper sealing. Outside of the port configuration, this intake adapter is identical to the #13001 adapter. Pictures of the #13103 intake adapter are down the page at right. The photo above shows a front view of part number 13001. The photo above shows a top view of part number 13001. The photo above shows part number 13001 with an Edelbrock Torker II intake installed. The photo above shows part number 13001 with a Weiand Tunnel Ram installed. The photo above shows one of the ports in the #13001 intake adapter. The photo above shows a side view of part number 13001. The photo above shows part number 13001 with the center plate removed; the O-ring that seals the center plate to the intake adapter is visible in this photo. The photo above shows part number 13002; the center plate is removed in this photo. The photo above shows a side view of part number 13002; note that the ports come straight out through the intake adapter. The photo above shows part number 13002 with the 13204 port plates installed. The photo above shows part number 13003, which includes starter holes for custom porting applications. The photo above shows part number 13004, which is essentially a blank canvas for custom porting applications. The photo above shows part number 13006, which is designed to be used with Yates style 351C intakes. Note that the Edelbrock 2991 is shown in this photo; that intake manifold is no longer available from Edelbrock. 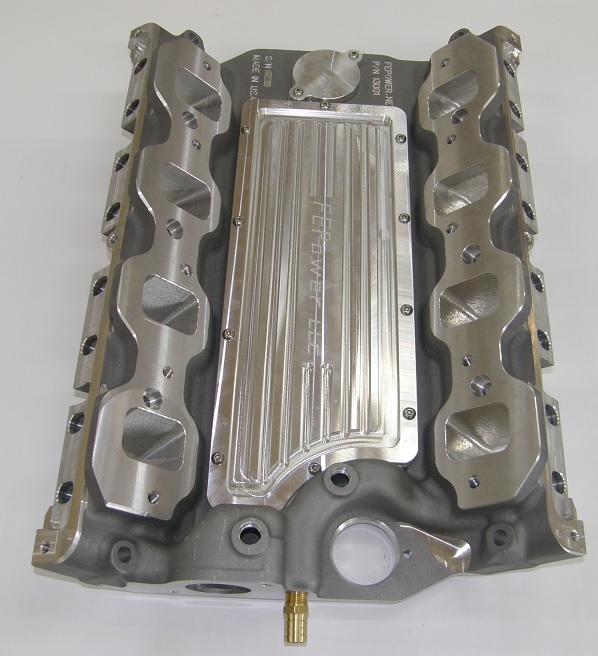 The Edelbrock 2863 intake, which is currently available, is also an excellent choice. 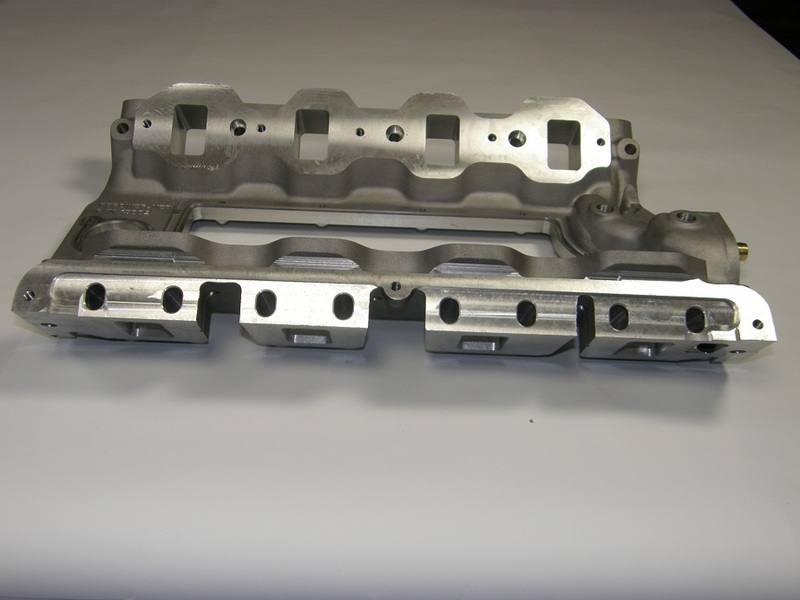 The photo above shows part number 13103, which is designed to work with the later Blue Thunder medium riser cylinder heads. The photo above shows a side view of 13103, showing the large ports that match up to the later Blue Thunder medium riser heads.